Professional Systems Network International (PSNI) just wrapped the fifth annual Preferred Vendor Partner (PVP) Champions Summit at the Renaissance Chicago O'Hare Suites Hotel July 7-9, 2014. 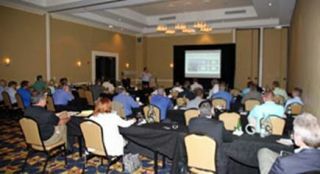 This year's event was attended by product decision makers from 32 affiliates and 16 PVPs. Attendees met in small groups with each PVP to discuss the industry, innovation, PVP programs and service offerings. This year's multi-day event boasted the largest attendance since its launch in 2010. The original PSNI PVP program's somewhat humble beginnings were in 2002 with PSNI working with just four vendor partners as a way to strengthen marketing partnerships with key manufacturers that support the AV and broadcast industry. Today, the PVP program includes 18 manufacturers, distributors, and service providers that represent nearly $100,000,000.00 in annual sales with PSNI affiliate partners. The PVP Champions Summit launched when PSNI asked each affiliate to assign a PVP program “Champion” to be the face of the affiliate for each PVP. By assigning a “champion,” each PVP has a point of contact to share knowledge regarding programs, pricing, changes and updates. In 2014, PSNI invited attendees that had decision-making system specification and design authority to meet with each PVP. That tradition continued this year, with the biggest difference being that this one boasts the largest attendance in the event's history.